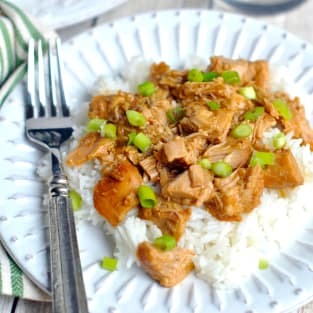 In a large slow cooker, combine chicken with soy sauce, orange juice, brown sugar, vinegar, water, red pepper, garlic, and salt. Heat on low, covered, for 6 hours. Fifteen minutes before serving, combine water with cornstarch (whisking them together). Pour into slow cooker, mix and allow to thicken (15 minutes to an hour). Serve over cooked rice and add green onion for garnish. ENJOY!